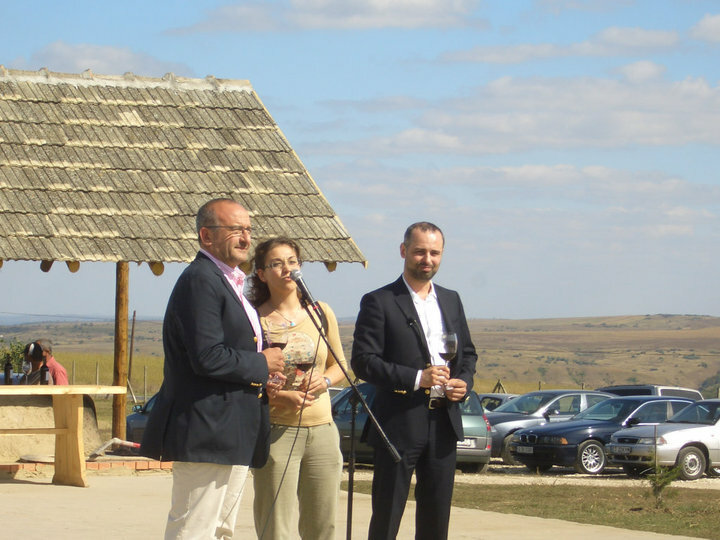 Last FRI, September the 24th 2010, a new winery was officially launched in Romania. This is the new project established here by Winero, having the same owners as the Bulgarian Enira. The new project is located in Aliman, some 90 km away from Constanta. They started to plant predominantly Merlot,with parts of Cabernet Sauvignon and 10 ha of Feteasca Neagra in 2008 and now they have about 80 ha of vines and a project to build the actual winery pretty soon. Overall an investment of 5 Millions EUR of which 2 Millions EUR are non-refundable EU funds. This is a welcoming investment in an extremely poor area where there was not much paid work available for the local peasants. FRI they have launched their first wine: the Alira Merlot 2009. Marc Dworkin,the winemaker, clearly mentioned that this first wine is a table wine intended for regular consumption. There is no point in claiming otherwise and we shouldn’t compare this new wine to Enira Reserva or to any other of their premium wines. The wine has just been bottled about 8-9 days ago and, in my opinion, it should be given some time to rest in the bottle prior to be released or drunk. There are about 50,000 bottles of Alira Merlot 2009 produced. There are however great expectations from their future releases. During the last meeting I had with Marc(see it here), he was very confident on the potential of the Romanian grape Feteasca Neagra(FN). So we should be looking forward to their future wine releases and hope he will keep his promises to show FN’s true potential.Unfortunately the 2010 vintage doesn’t help him too much as March proved to be a very difficult month with freezing temperatures therefore most of the crops were completely damaged. Marc mentioned that from the 10 ha of Feteasca Neagra they have, they would probably harvest only 2 tonnes of grapes overall this year. It is really sad to walk into the vineyards and see so many FN vines with no fruit at all. 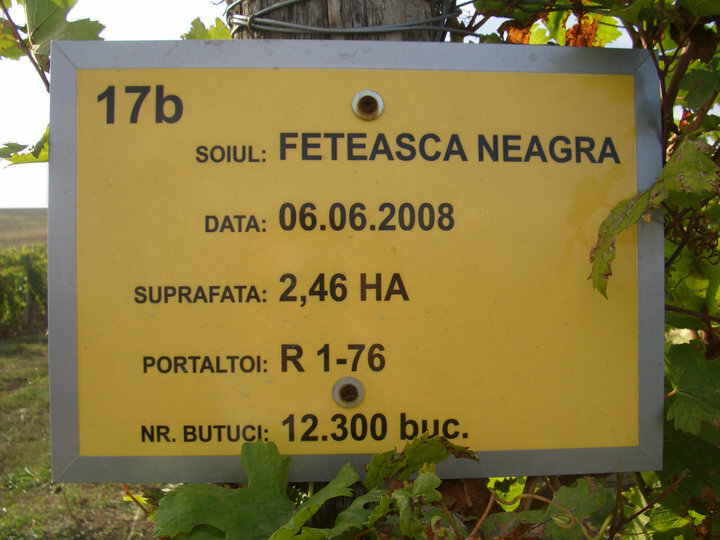 In fact, 2010 is a very difficult vintage for most of the wine producers in Romania. Other people in the wine business, from Dealu Mare region, are blaming the bad weather for damaging the vines in the lower fields.The only ones still all right are the hill top ones where the wind was able to blow more. Up to this moment the red grapes have a high acidity but not enough sugar levels and the weather prospect is not very encouraging. 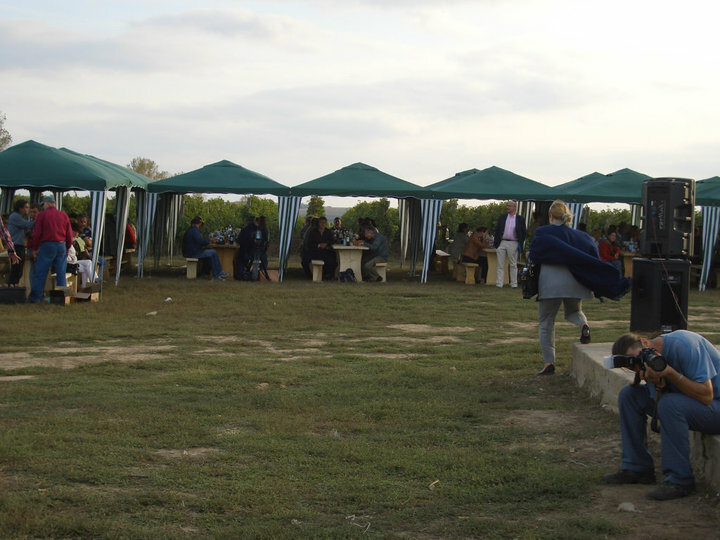 Coming back to the launching party, the organizers did a very good job and about 200 guests spent a lovely time celebrating the newly released wine and also the inception of the 2010 harvest season with many Enira wines, great food and Romanian traditional music. paired with freshly baked bread. I wish the new winery a long life with many outstanding wines ahead. 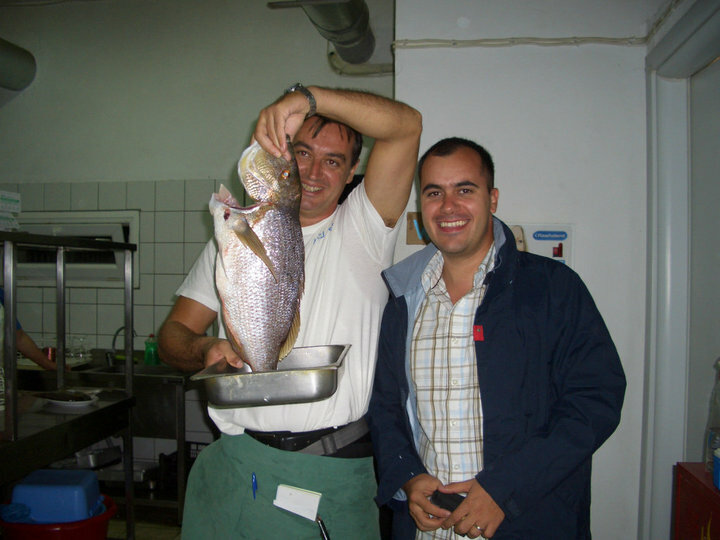 My recent vacation to Greece gave me the possibility to eat lots of sea food and also try some very interesting Greek wines. I haven’t tasted any remarkable Greek red wine so far, however the whites are really interesting and one was really excellent. I visited Thassos this year and last year as well, a place I always find lovely, with warm people, amazingly clear blue greenish sea and really decent prices. 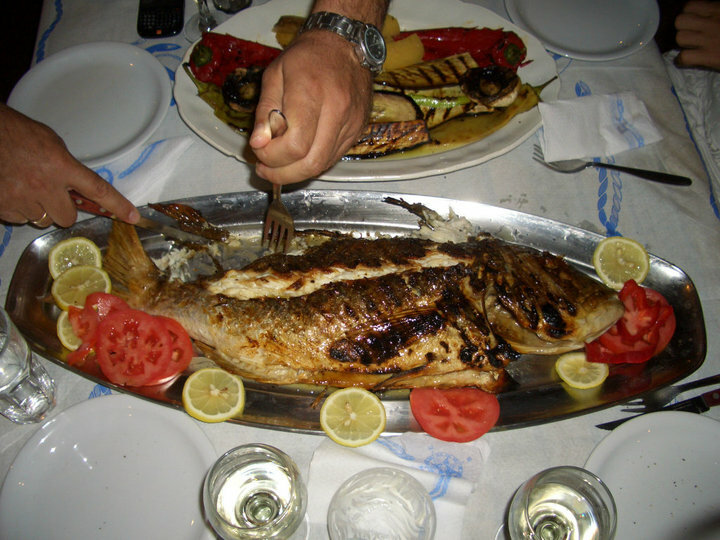 We had a memorable dinner one night at Taverna Mouses serving a fresh 3 kilo white snapper that we ordered a day in advance, grilled slowly for 1 h and served with a sauce of olive oil and lemon. 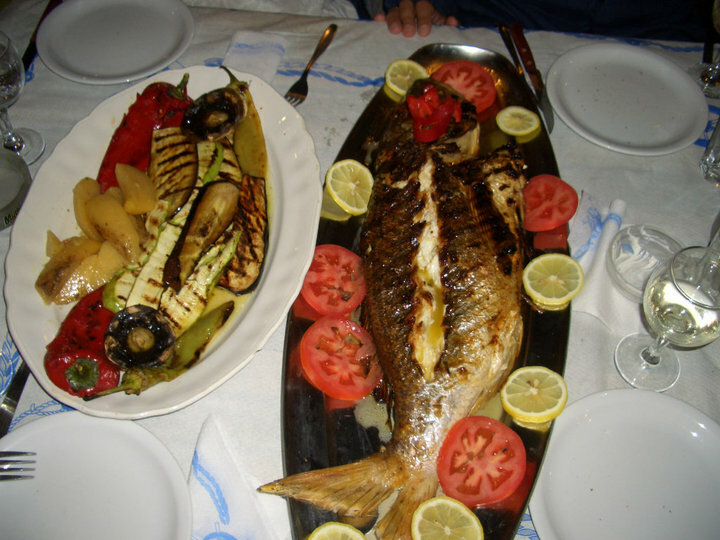 A really tasty meal and enough to do an over dose of fish for 4 persons easily, at least that’s what we did. 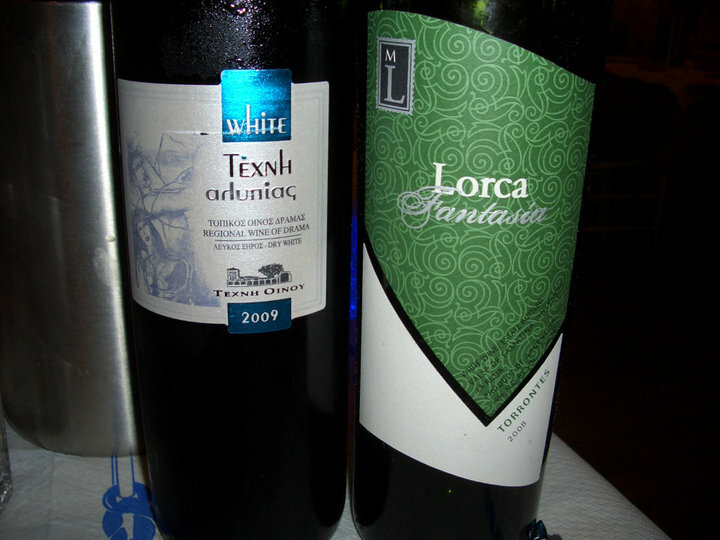 During my vacation, I tried about 6-7 different Greek wines and what I find common to their whites is the pleasant high acidity, freshness and the nice floral flavors they have. There are three whites that I particularly liked. 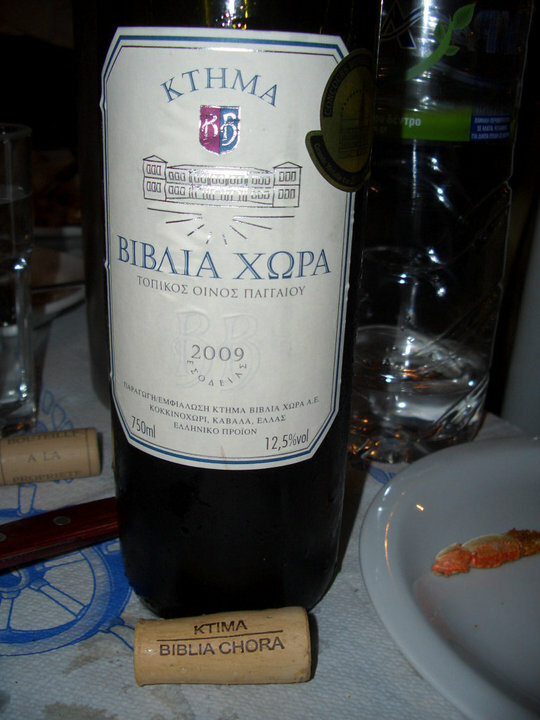 This is a well known wine, very appreciated by the Greeks, a blend of Sauvignon Blanc and the local grape Assyrtiko. The wine has a pale greenish yellow color. The nose is fresh with huge floral flavors of elder and acacia, with green apple, lime and herbal tones on the background. In the mouth this wine is fresh and vibrant, with a high acidity, a very nice concentration, with the same floral aromas as in the nose, finishing with a beautiful medium plus aftertaste. Excellent wine and perfect match for the big fish. Had this wine after an Argentinian 2008 Fantasia Torrontes from Mauricio Lorca and perhaps that’s why it felt less concentrated. Had this wine together with the 2007 Reserve de Gassac from Mas de Daumas Gassac which has a better length and concentration. The unpleasant part of a vacation are the extra kilos gained over a short period of time. But no worries, a few weeks at the gym will solve it. I received these two Argentinian wines for tasting from Cramele Halewood, the importer of Trapiche to Romania. 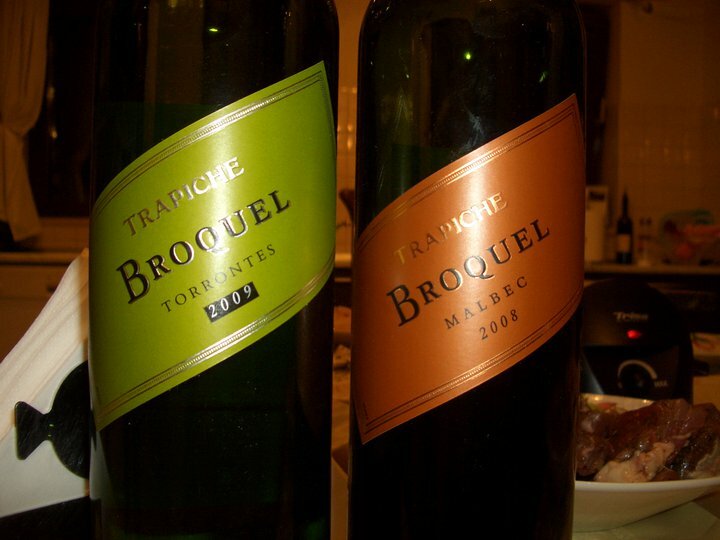 The Broquel wines have a price of around 10 EUR per bottle both for the white as the red. 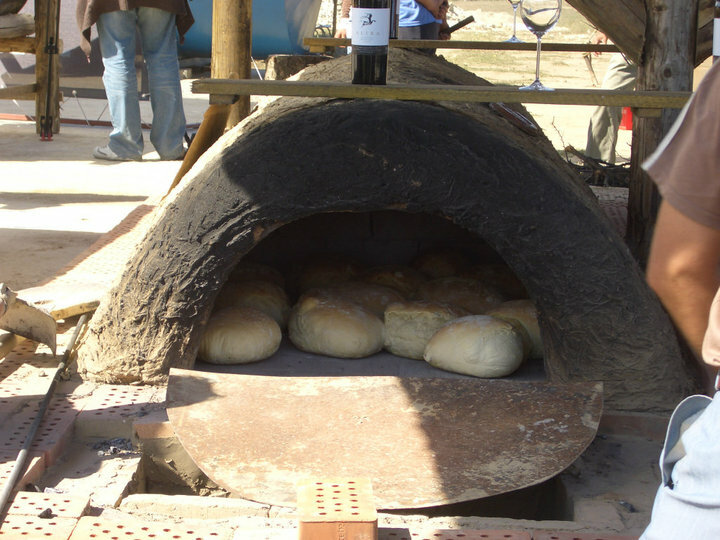 Torrontes is poised to be, just like the Malbec is for the reds, the flagship white wine of Argentina. 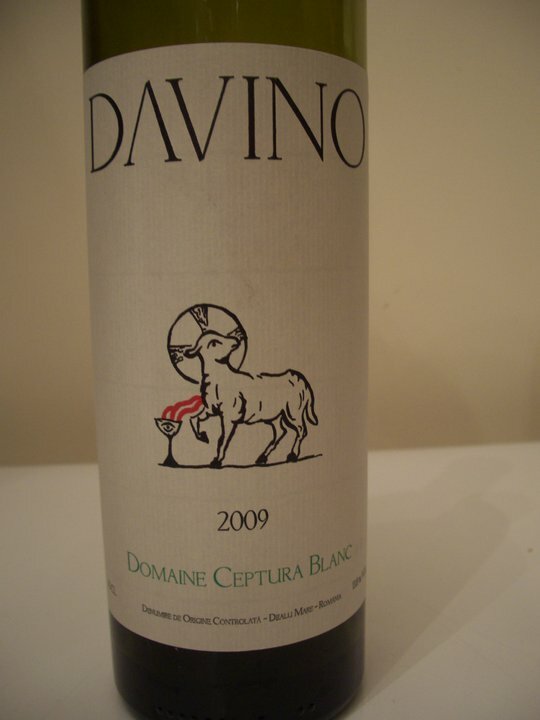 I like this grape variety for its rich aromatics, its good structure and usually is inexpensive. The wine has a clear yellow lemon color. 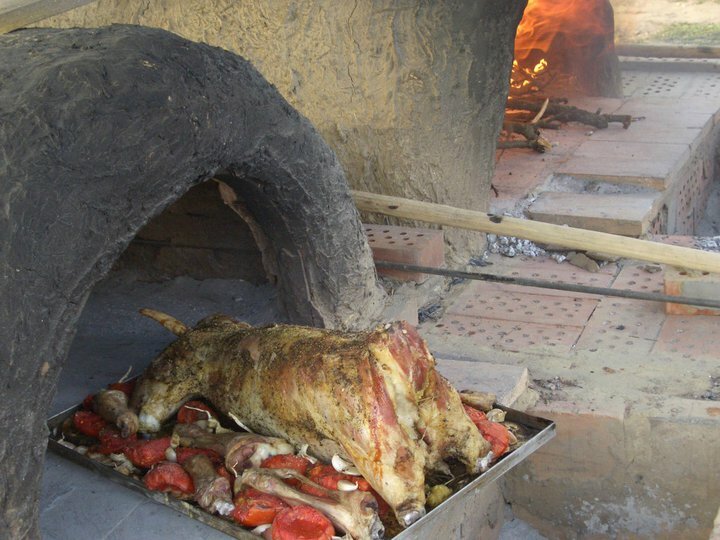 The nose is fresh with strong aromas of acacia and elder. In the mouth the wine starts with an immediate off dry sensation, a higher acidity than the Torrontes that makes it vibrant, fresh and almost reminding of a Frizzante. Notes of white and yellow flowers, ripe apples and pears are making the taste of this crispy medium body wine that finishes fresh with a medium aftertaste. Good+ to Very good. The price is around 18 EUR in wine shops. The wine has a dark red-purple color. The wine is very fruit forward with a creamy sweet mix of different ripe dark berries on the nose. In the mouth this medium body wine shows flavors of blackberry and black cherry, with a pleasant mouth feel and a short to medium finish. Good+. This is not a fancy wine but a good value one that should be a good pairing to any regular barbecue. If you get to taste any of these wines please leave a comment with your impressions. Some of the last weekends with good and warm weather of this summer are good opportunities to drink white wine. Pretty soon the cold weather will settle in and will slowly make the shift towards drinking more red wine. Me, I just take any opportunity I have and enjoy more white wines for the moment. On my last trip to Paris I paid a visit to one of the most impressive wine stores I have seen so far: la Bibliothèque des Vins des Galeries Lafayette. They have an impressive collection of wines from Bordeaux and the rest of France. This is really a must visit place for any wine geek when traveling to Paris. One of my purchases was a 2008 Chateau Puech-Haut Tete de Belier Blanc for 25 EUR. 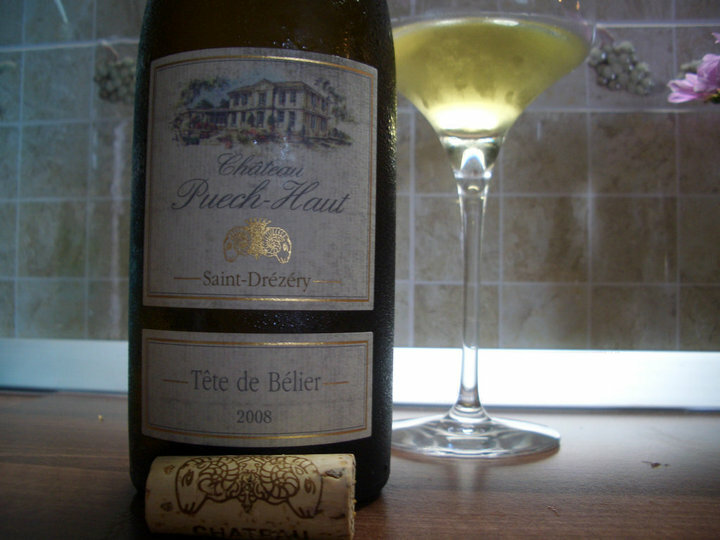 I have already mentioned the memorable experience I had when drinking Chateau Puech Haut-Tete de Belier Blanc 2006. As I had some Black Tuna that had to be cooked, I naturally needed a good wine pairing for the dish. A big dish requires a big wine, so I ended up opening the wine from Paris. A little bit about the food. 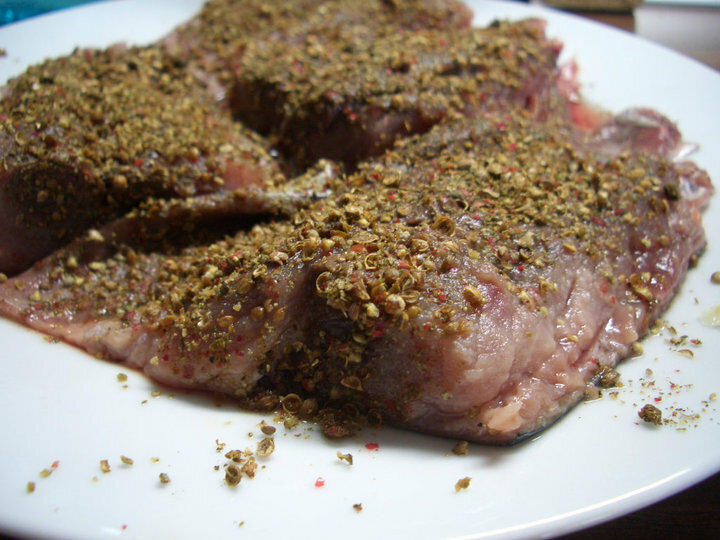 It is the first time I’m cooking Tuna so after a little research on the Internet I found an interesting recipe of Pepper-steak Tuna with Provencal sauce. 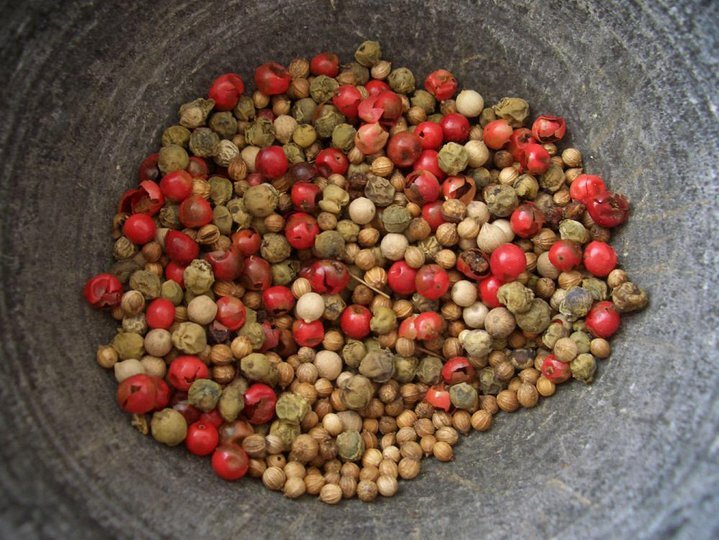 For the Tuna steak I mixed red and green peppercorns with coriander in a jar. and grilled it until done but still juicy on the inside, about 7-8 minutes. 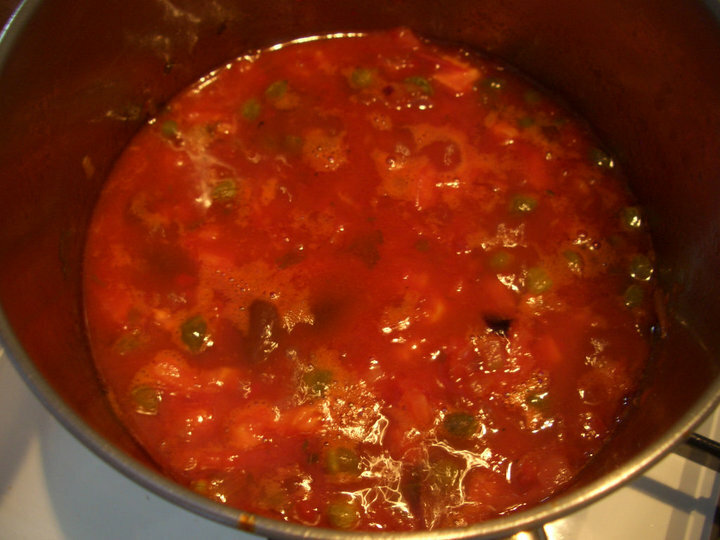 The sauce was a mix of shallots and garlic fried for 2 minutes in olive oil, then added capers, olives, tomatoes sauce, a fresh cut tomato as well, thyme and everything boiled for 10 minutes. 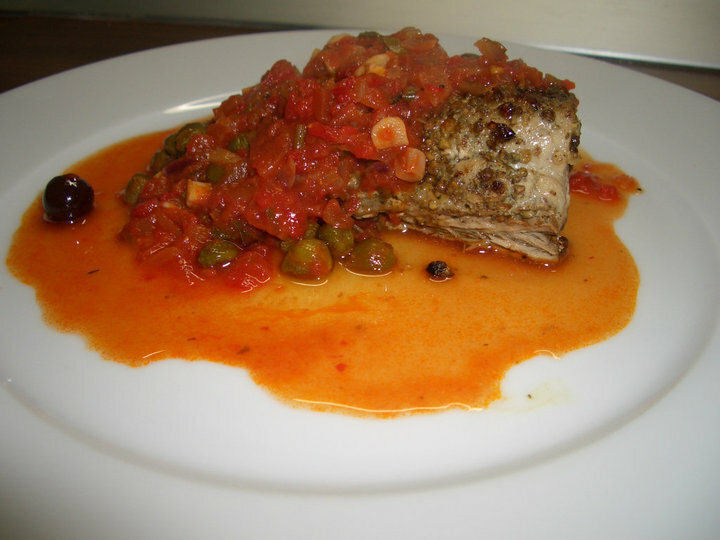 The Tuna has a very thick structure so the pairing wine needs to be a medium body red or a full body white wine. I am pretty sure this dish can go very well with a red wine also, but I opted for the big and generous Tete de Belier Blanc from Chateau Puech-Haut. The wine is a blend of 70% Roussane, 20% Marssane and 10% Grenache Blanc matured in large French oak barrels for about 8 months. Alcohol level is 14%. The wine has a clear green-gold color. The nose is very complex with floral flavors of acacia and linden, spicy with white pepper, has hints of honey,vanilla and stone fruits. In the mouth the wine is unctuous with an initial off dry sensation(sweetness), full body, round, with a marvelous balance, gives a good mouth feel, showing a nice freshness, with aromas of honey, spices, ripe apples and pears, yellow flowers, white chocolate and a hint of minerality. The wine finishes dry with notes of fresh vanilla, acacia, honey and Asian spices in a long aftertaste. 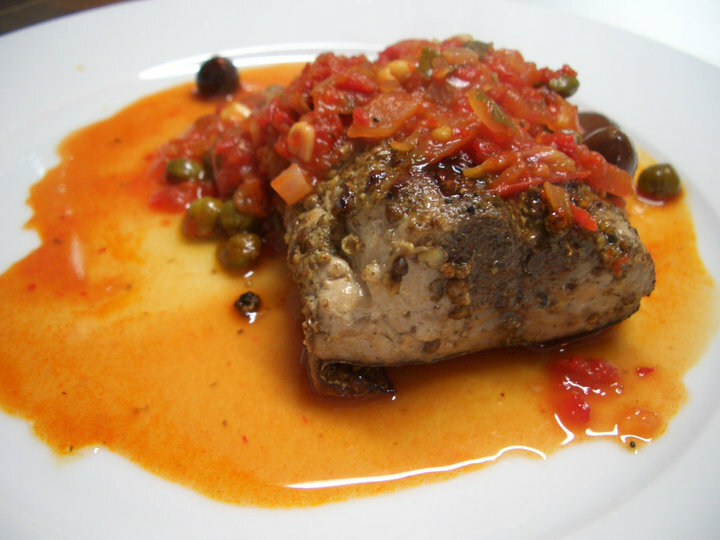 Superb wine and beautiful pairing with the peppery Tuna steak. Excellent+ wine and always a buy. Mr Gerard Bru, the owner of this Chateau, is doing an amazing job keeping the wines consistently good. Michel Rolland is a consultant at the property. Really good made wine. This weekend I also had another bottle of Antinori Chianti Classico Riserva 2005,a wine that the more I taste it the more I love it. And for the 15-20 EUR price I find it very hard to beat. I prefer more the Simonsig Chenin Blanc as I find it better concentrated, with nice aromatics and pleasant medium aftertaste. I had this wine paired with a tasty dish of fresh boiled crabs with a sauce made of mayo, garlic, parsley and lemon juice. Tasty food and good wine pairing overall. Update: tasted the wine the second day. The herbal character faded away and what remained is an extremely spicy wine, with a pleasant greenness on the nose and mouth. It feels like biting a fresh green bell pepper together with a strong flavor of ginger that remains long in the aftertaste. This is really a wine that you either love either you just hate. I had the wine paired with a spicy dish of pasta with minced beef and a tomatoes based sauce. The wine really did well in this company. I am upgrading my rating from Good to Very Good. The spiciness of this wine reminded me of a red wine I had a while ago – Domaine de Ravanes – Le Prim Verd 2002, produced in Languedoc. Le Prim Verd is a 100% Petit Verdot, a grape usually used in small percentages in Bordeaux blends, as its spiciness brings more complexity. This sensation of biting a fresh green bell pepper and ginger is similar to this South African Sauvignon Blanc. Very interesting to try both wines. Domaine de Ravanes – le Prim Verd 2002 sells for 30-35 EUR so a more expensive red wine compared to the 5-6 EUR Simonsig Sunbird SB.